It’s also a bittersweet day as three years ago today my grandpa was rushed to the ER and began his battle with cancer. I wish he had been here with us today, but instead, he was with us in spirit. I just wanted to share my favorite photo of him. This is from WWIi. 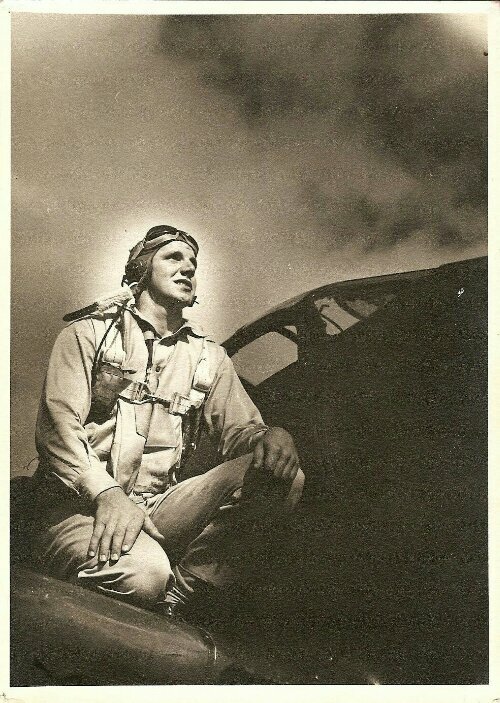 My grandpa was a fighter pilot stationed in England and was much decorated. He was shot down over Bazougers, France and eventually became a POW after evading the Nazis with the help of the townspeople. He was at several prison camps, including Stalag Luft Iii (scene of “The Great Escape”), and escaped himself many times. He was liberated after the war. My grandpa went on to serve in Korea and was a quasi-diplomat, stationed in Spain and Venezuela. He retired a colonel and moved up here to our California ranch in the early 70s. I was very close to my grandpa and miss him each and every day and I’m very proud to be his granddaughter. Someday I will start a site and share his many, many photographs of WWIi, but for now, I will share this one. Happy Father’s Day, grandpa. « Sophie has been adopted!